Should the Jackets plead their case for a College Football Playoff berth three months from now, the selection committee will likely consider the team’s 69-6 shellacking of Alcorn State as just that: a dominant win over a drastically overmatched opponent — but ultimately, an insignificant one. Tech supporters, though, might remember the season opener for something else: their introduction to freshman B-Back Marcus Marshall. A single game versus an FCS opponent is an inadequate sample to draw conclusions, but the Millbrook, N.C., product’s dominant debut should nonetheless inspire optimism about the Tech offense’s ability to sustain the prolific rushing attack that has propelled it in recent seasons. Marshall’s arrival in The Flats could hardly be timed better. Over the offseason, the team lost B-back Zach Laskey to graduation and A-back Dennis Andrews to dismissal. The former was instrumental to Tech’s success last year, and the latter was expected to play a major role this season, so the Jackets will look to a young backfield to carry the load in 2015. Playing time is there for the taking, and in his first snaps of collegiate action, Marshall made an early case for a significant role. Against Alcorn State, he ran with the savvy of an upperclassman, quickly seeking holes and accelerating through them. Four of eight touches went for ten yards or more, his burst enabling him to burn the entire Braves defense on multiple occasions. The former three-star recruit wasn’t perfect — he was stuffed on a few occasions, and his second-quarter fumble was the Jackets’ only turnover — but little more could reasonably be expected from a true freshman. While they were understandably cautious in their praise, Marshall’s coaches and teammates spoke positively about his debut in Tech’s postgame press conference. 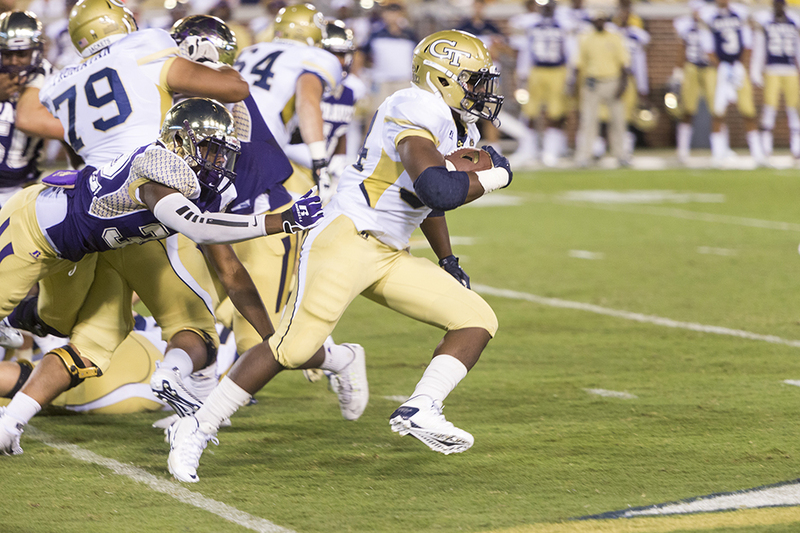 Head coach Paul Johnson noted the need for improved ball security but commended the B-back’s “ability, … good feet … [and] good speed,” courtesy of ramblinwreck.com. Johnson mentioned that Marshall and his fellow freshmen “acquitted themselves okay” and would be expected to improve moving forward. Redshirt junior and reigning Orange Bowl MVP Justin Thomas largely determines which backs get touches on gameday, so Marshall will no doubt look to develop a rapport with his quarterback. Well-accustomed to flying under the radar, the Jackets will no doubt look to deflate any gaudy expectations regarding Marcus Marshall’s freshman year. Marshall himself demurred when asked about his debut, crediting the experienced Tech offensive line for his success. “The first one, it was kind of crazy,” Marshall said of his performance. “I was really excited when I saw it open up like that. Same with the second one. My O-line did a great job on both. They made it easy. I just outran people,” courtesy of ramblinwreck.com. The team employs a committee of running backs: with graduate transfer Patrick Skov leading the group in touches versus the Braves and Broderick Snoddy displaying explosion in his return from a leg injury, the three-star recruit will be forced to earn his carries. However, the early returns on Marshall suggest that he’s up to the challenge. Come December, that could mean far more for the Jackets than the final score last Thursday night. It will be interesting to see how Marshall fares against the tougher opponents Tech will face this season, and his playing time moving forward will be largely based upon his level of play in those games. That being said, he has shown that he can be a major force out of the backfield and that is certainly something the Jackets could use in their triple-option offense.